In September 2016, SAP announced the general availability of SAP HANA, express edition (HXE), for everyone trying to get their hands on a HANA instance for free. Although SAP Cloud Platform already offers a perpetual developer license, the biggest breakthrough with HXE is that it can have a productive use up to 32 GB totally for free. In my quest to get my own HXE instance totally for free, i.e., free license, free hosting and free Operating System, I have published a set of tutorials to install HXE on an Ubuntu Linux operating system on Google Cloud Platform. You will need to decide whether you want the database only or you want the XS Advanced Applications too. The difference? The database server includes the in-memory DB with the embedded advanced analytics such as geospatial, predictive analytic library, graph, text, search and you can add the extended machine learning library to it. You can connect to it using any SQL client that supports JDBC (e.g., HANA Studio, DBeaver, etc.). The XS Advanced applications enable many features from Cloud Foundry but on premise (here’s an introduction). It also brings tools such as the Adminsitration Cockpit and SAP Web IDE for SAP HANA to, for example, leverage the Node.js and Java buildpacks, use SAPUI5 as a micro-service or the Enterprise Architecture Designer. Following is the list of tutorials where the steps are explained. They have been created for those who do not have any experience with Linux operating systems, so do not be afraid to take one more step closer to becoming a ninja. Looking to eliminate the economic and resources constraint many developers face. The server-only edition can run on 8GB RAM and the server + XS applications will need at least 16 GB (although 32 GB are recommended). These resources are not available in everyone’s laptop. You can install HXE on Amazon Web Services or Microsoft Azure. For the latter, you can get a free trial for the first month but, in both cases, you will need to pay for the operating System’s license after their initial trial. The reasons are plenty. First, the setup process of a Virtual Machine with an Ubuntu operating system image is one of the easiest I have tried. Second, they will give you a credit for the first 60 days. Once those days are over, they will start charging the lowest rate I have seen so far. Third, the interface and console are friendly even for those who are not familiar with a console. Ubuntu is one of the most popular Linux distributions. SAP HANA is officially supported in SLES and RHEL. HXE is a community support model only. Therefore, I trust the community of both Ubuntu and HANA developers can help each other. In fact, I have been using my instance intensively without any problems so far. If you think this can help others, please share! Last, I’ll be happy to connect on Twitter or on LinkedIn ! Great info! Quick question, I assume you did this with HANA Express “1.0”? Any thoughts on this approach working with HANA Exp 2.0? I am not clear whether Ubuntu would support as the only ‘official’ documentation states SLES 12 SP1 or RedHat RHEL 7.2. Hi, Kris! Thanks for reading! I used the 2.0 version. SAP HANA is officially supported in RHEL and SUSE. HXE however is a community-supported model, so that applies to either SPS12 or 2.0 which are available for download. I followed all the instructions and my VM is working like a charm! Finally I will be able to play. That’s excellent news, Valter! Also, thank you very much for the feedback. I hope I can publish those corrections ASAP. Up and running …had to scratch my head a few times but got there. One thing to note is that sudo su is not needed in Google as sudo alone works. Also, the tutorial on the firewall rules has a small error i.e. rule 8 is defined twice so had to create a rule 15 to fix. Question on the application installation for HANA Dashboard and EA Designer, I assume that these are installed as part of hxexsa.tgz? Are these actually installed or just made available for installation on the instance? Hi, Kris! That’s great news! I’ll be publishing some corrections (including the firewall one) between today and tomorrow. I could use your feedback on where you had to scratch your head so that future readers don’t have to, if you don’t mind. You’ve mentioned using “instance intensively” but what exactly are you doing with it, if it’s not a secret? I’ve been using it to develop the scenarios in the tutorials site, in demoes at CodeJam events, loading data, integrating with external APIs and doing some modelling. I kept both instances, the XSA and the server-only and alternate between one and the other to see if I run into roadblocks or issues. No productve apps in any of them (yet), but would love to know if anyone is doing so. The Google Cloud Launcher item seems to be set to have SUSE. Can I ask how you changed it to Ubuntu? Also keep in mind that Ubuntu is not ‘officially’ supported and what I am doing is just for personal tests and exploration. If you have ambitions of using in a productive environment then you would need to look at the official OS offerings. If you do not want to install yourself, then going with the Google offering is a good choice. It will be cheap enough even with SUSE as I am guessing you will not be running 24/7? 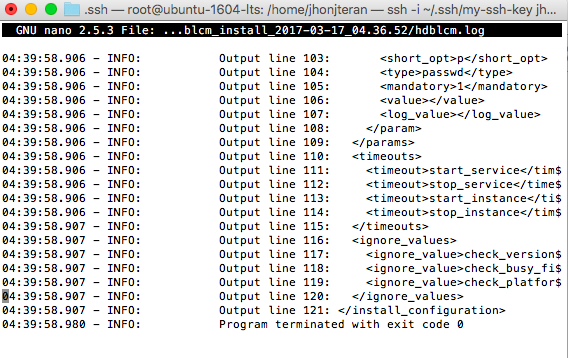 I tried to following the instructions to install the HANA Express in my GCP. I have done all the preparations. But I got the following errors when I was installing it. I have checked the firewall setting advised by you. It’s ok. 50013 and 50014 are bypassed by firewall. Could you please give me some suggestion? Steven, I passed this issue, all the steps where the hostname appears must be consistent with the instructions, in my case I didn’t realize that the instance name has to be the same as the hostname, so I have instance-1 as my instance so I couldn’t have my hostname as ubuntu-1604-lts, that was my error, I changed the hostname by instance-1 and the problem was solved. Kindly I ask for your help Lucia or Steve if you could find something. Please remember to run everything as root (or sudo each command). You may also want to check RAM levels in GCP’s console for that instance. Now I’m starting to play with my own HANA Express. Thank you very much for this blog, may be later with your permission I’m going to publish a blog about this steps from my experience in spanish for my colleagues in latin america (specially). Hola, Jhon! The chmod -R is in the tutorial for the entire targz file, so I wonder why that didn’t work. Wow Lucia I didn’t know that you are from Argentina. Muy buena representacion de America Latina en la comunidad, te felicito!. Realmente fue una coincidencia haber encontrado este blog y que fuera de un latino, no es muy frecuente. Excelente trabajo!!!. Hello Lucia / Steven, I have exactly the same error that Steven, I don’t know if I made a mistake with the steps about the hostname but the only difference with your screenshots is the hostname that appears by default empty in my installation steps but not in yours. I just left that issue and started the services. Seems every service can be started. But I do NOT have space DEV installed in the system. I have no idea why??? I just have one space ‘SAP’…. Is it normal? Steven, I’m not there yet, may be Lucia can help us with that, I’m stuck with another error now. Hi, I think it should be there but I don’t remember whether it was DEV or “development”. so it somewhat contradicts itself. Could you confirm the final intended result? Hi, Giles, the picture says “!#/bin/bash”. We got the suggestion to be able to enlarge them so that they look more clear. Hi, Dinarte, these tutorials are not yet updated for SPS02. Unfortunately, even though product management is looking into this issue, we cannot provide with an answer yet. I will update those tutorials accordingly once we do.